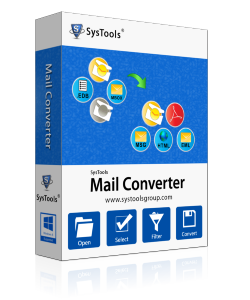 SysTools Mail Converter Software got the 5 stars rating from Cnet for its efficient working. The Email Converter tool allows to Convert Outlook Data File items to desired output file type. You can convert emails, contacts, calendars, tasks, notes etc. of both ANSI & Unicode MS Outlook versions 2000/2003/2007/2010/2013. The best email conversion software is capable of converting entire items from an Offline Outlook Data file of any size. It is possible to successfully convert multiple emails, calendars, contacts, and other items into any of the featured output file type. The Email converter tool allows you to convert the data items from all versions of Microsoft Exchange Database File. All items from the mailbox & public folder of Exchange Server can be converted to any file format. The software is supportive towards the conversion of multiple emails from mbox files created using any email platform such as: Mozilla Thunderbird, Apple Mail, Entourage, Eudora, Turnpike, Google Takeout etc. Mail Filters: You can convert emails by a date (according to sent or received date) that specifies "Ignore if older than" or "Ignore if newer than" criteria. Calendar Filter: Set date to ignore entries if older than or newer than any specific date. Task Filter: Convert task items older than or newer than a specified date. As the email conversion software scans and loads the selected data files, it shows the entire items or folders in it. Along with this, it allows to check the folders or items which you want to convert. This way, selective conversion of email client's data can be done. Mail Converter scans each file that is selected and loads the complete folder structure in its actual hierarchy. Also, Original & on-disk folders structure of the files are maintained even after the email conversion with their other items. MS Outlook 2003, 2007, 2010 (32/64 bit) and 2013 (32/64 bit) should be installed with dummy POP3 profile configured for converting to PST format. Microsoft .NET framework 2.0 and above should be installed. Will I be able to convert attachments of MS Outlook file emails in Adobe PDF? Converting to Adobe PDF option allows users to convert their mails or other data into PDF format. Email attachments are embedded within PDF in their original form via conversion. Clicking on "Paper Clip" icon will let you view the attachments. You can also download and save them on your machine. Does the software has any platform dependency? Mail Converter is a Windows platform based software and can be installed on any version of Windows OS successfully. It also supports the latest Windows 10 version. How to Convert email files using best email converter software? Browse File From Local Storage & Click Next. Can I use this software for PST file created in Outlook 2013? Yes, email converter software is compatible with all versions of Outlook like: 2002, 2003, 2007, 2010, 2013, 2016. I want to convert a specific set of Outlook emails to PDF. Is it possible? Is it possible to convert Outlook emails of a specified interval into PDF format. Can I use this software for such type of conversion? Yes, this application features different kinds of filters such as Mail Filter, Calendar Filter and Task Filter. By using them you can convert data from a specific interval. Can I recover and convert corrupted data files? I prefer to get the access of the complete data on my desktop itself and the software Mail Converter helps me a lot in meeting this challenge. I receive data from different email platforms and all in a go I am now able to convert them to the format I need. I usually prefer to get the file data in PST format and I feel mail Converter is the smartest choice to get this process done. Thanks for providing the best multiple email conversion tool! We had always made sure that the investment we make towards simplifying work at organization is worth every penny. And it's a pleasure stating that, Mail Converter tool has been amongst the most prized choices we made. Conversion was our need and conveniently serving the same to us was your expertise. Thanks. I really want to admire Email Conversion software for its brilliant performance. I have used this tool to convert my exchange database mailbox file. It provides me vision to export my database file to multiple file formats. Thanks for such nice software once again. I have been searching for best email conversion utilities for long time. But my findings work for me & Luckily I found SysTools Email Conversion Software. It fulfils all my needs of email converter software. The user interface of software is absolutely designed to provide maximum ease to user. I loved to work with it.